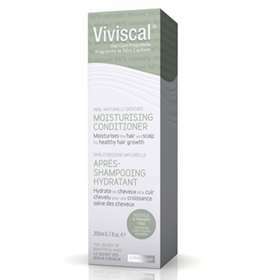 Viviscal Moisturising Conditioner has been specifically formulated to promote healthy hair growth. With a formula that is 96% naturally derived, Viviscal Moisturising Conditioner contains Argan and Hazelnut oils which soften, nourish and condition the scalp and hair. with Creatine which helps promote smoothness and volume. Free from parabens, artificial colours and fragrances. For best results: After shampooing apply a generous amount to your hair and massage gently from roots to ends. Leave in for two minutes to let the conditioning ingredients work. Rinse thoroughly. Use only as directed. For external use only. Avoid contact with eyes. If contact occurs, rinse with water. Keep out of reach of children.